Performed with great artists like Kalamandalam Gopi, Kottaykal Shivaraman, Madavoor Vasudevan Nair, Mankombhu Shivashankara Pilla, Kalamandalam Vasupesharadi and many others. 5 years after he joined at the RLV College in Trippunithura for Masters degree in Kathakali. For temples programs all over Kerala, tourist programs all over India and Cultural Festivals abroad ( Italy 2004 – France 2007 and 2011). He has also performed with great artists like Kalamandalam Gopi, Kottaykal Shivaraman, Madavoor Vasudevan Nair, Mankombhu Shivashankara Pilla, Kalamandalam Vasupesharadi and many others. Started to teach Kathakali in 2005 and ten of his students started to perform. 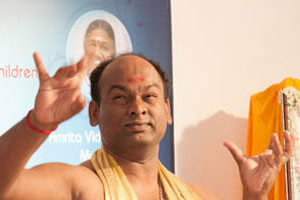 Gitamritam speaker in the years 2012, 2013.